Close your eyes and try to imagine an enchanted beach bordering on a immense stretch of greenery. Now hold your breath and take a dip into an ancient, magical past, with rustic farmsteads and fascinating olive trees, where reality far surpasses imagination. 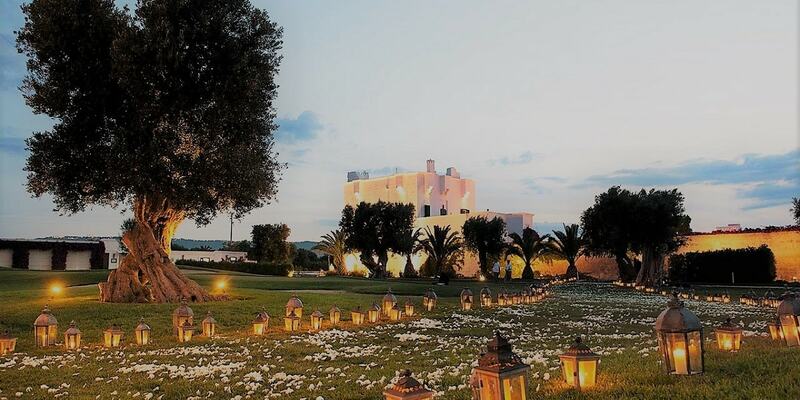 Open your eyes and experience your wedding in a Masseria in Puglia. Getting married in this region is a bit like marrying Apulia itself with its customs, its flavours and its traditions. A ceremony under the olive trees and close to the sea, between the characteristic rich red soil and the blue horizon, a country chic wedding in a Massria, is a wedding experiences that nobody will never forget. Once used to be aristocrat houses, these fortified properties range from five-star hotels with luxury spas, gourmet restaurants and modern facilities to big elegant homes with spectacular grounds and swimming pools. That’s why apulian Masserias are today the perfect wedding venue for a wedding in Apulia. Among the 100 most romantic hotels in the world, is located on a large estate in Savelletri di Fasano, Brindisi, not from the sea. Walking through the courtyard, and coming across a combination of history, tradition and charm, is A location of charm and beauty, the perfect setting for an elegant, refined wedding in Puglia. The Masseria of noble origin as tenure of the Barons Noya and dating back to 1696, is located 20 km from Bari, a few steps from the sea. This wedding venue has three different rooms with a noble courtyard in front and an ancient garden that testimony the past, as well as six rooms to host brids and grooms in their wedding day. La Masseria Santa Lucia - Dolce Vita Beach, with its perfect combination of an old-fashioned farmhouse and the magnificent scenery of a beach with fine sand both recreate emotions of a fairytale wedding in Puglia. It offers, in a contemporary key, the hospitality and the traditional features of the ancient farmhouses of Puglia.